Used by most of the T-shirt artist in the US this double action airbrush can achieve spray patterns from fine detail to broader coverage, easily handling light, medium and heavy fluids. The VL is available in 3 sizes, 1, 3 and 5. This versatile package comes configured as a number 3, and includes needles, nozzles and aircaps to convert it to either 1 or 5 as well. Requires an air compressor, which is not included. 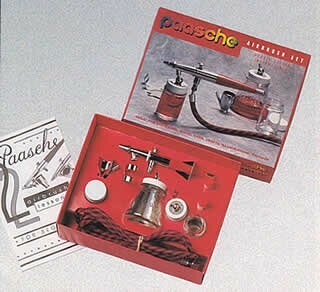 See "Airbrush Compressors" category.